Besides the difference in size (Males are generally larger), gender can be determined by the legs. While females have all three pairs close to the same size, males forelegs are much larger than the other two pairs. Like Amano shrimp, Wood shrimp require salt water to reproduce. Thus far, there have been no reported successes in captivity. The Wood Shrimp is a filter feeder and will sit where there's good current and filter feed from there. If the tank water is too clean the shrimp can starve, you can crumble food such as plec wafers into the current and the shrimp will feed from the particles it catches. If you keep a few Amano Shrimp in the tank, the females should provide a steady stream of planktonic larvae which the Wood Shrimp will happily consume as they float by in the stream. A ratio of about 9 female Amano's seems to keep 3 adult Wood shrimp from picking the floor in a clean aquarium. 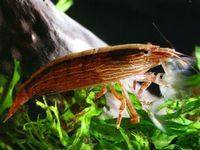 The Wood Shrimp is best kept in a heavily planted aquarium. Your shrimp may starve if your water is pristine, as they feed on suspended particles in the water. Wood shrimp will frequently stand under the filter outflow and collect food out of the high speed water. Approximately once a month (Depending on diet, age and environmental factors, it could be more or less frequent), the shrimp will molt (Shed its old shell to allow a new, slightly larger one to form). During this time, the shrimp will seek out a place to hide while it's new shell hardens, for safety reasons. Many unexperienced aquarists jump to conclusions, assuming their unseen shrimp to have been eaten; these fears are short lived however, as they usually reappear after a few days. The Wood Shrimp is an attractive shrimp with thin horizontal red lines running down the body and a thick white stripe down the spine. This page was last edited on 8 October 2017, at 15:39.